"The Sciences do not try to explain, they hardly even try to interpret, they mainly make models. By a model is meant a mathematical construct which, with the addition of certain verbal interpretations, describes observed phenomena. The justification of such a mathematical construct is solely and precisely that it is expected to work. "�John Von Neumann. There were three objectives to this research: Firstly, to understand the nature of crowd dynamics with respect to crowd safety. Secondly, to develop a more appropriate risk analysis methodology for the design and management of places where crowds may develop. Finally, to create a tool that allows others to understand the nature, problems and necessary components of crowds and crowd dynamics. Crowd dynamics are complex, therefore it is not enough simply to build a model as Von Neumann states. There was a need to construct a model that explains how and why people can die in a crowd. There was also a need a build a model that explains the many different types of crowd behaviour we observe in stadia and stations. With the original Legion crowd simulation system we begin to understand the reasons why specific areas produce predictable crowd behaviours and the effects that can have on crowd safety. The original VEgAS algorithms contained many different behavioural rules. It was apparent that this approach is fundamentally intractable. Some recent research [96, 97] using rule based cellular automata demonstrate similar speed density relationships as the Legion pedestrian simulation model. To investigate the nature of crowd dynamics, we need to satisfy Occam's Razor. By a process of elimination behavioural rules can be reduced to four interactive rules, Objective, Motility, Constraint and Assimilation. These four rules produced crowd behaviour that was too regular compared to reality. This problem was solved by the addition of noise which produced realistic crowd dynamics. Noise is added to the distribution of entity speeds and to their direction (Objective). By varying the speed distribution curve we can alter the composition of the crowd. Homogeneity produces marching armies of entities whereas heterogeneity produces indecisive and wandering crowds. This is a form of simulated annealing which provides a tractable solution to problems of N-dimensional control spaces (Metropolis ). We note that the geometric constraints impose a self-organisation effect on the crowd and homogenises the noise. Entities solve for the least effort from their present position to their destination using focal routes. The entities are self-contained problem solving individuals, each following simple rules with limited intelligence, which produces the emergent behaviour. We have outlined some of the interactions between the crowd and its environment. We have also outlined the development, application, validation and results of a simulation technique for determining the character and critical dynamics relating to crowd safety. We have seen that the addition of noise can produce different types of crowd dynamics. This is important in testing different phases of a stadium design, for example, where 2 hours prior to gates opening the crowd has few objectives and drifts in random-like patterns. As the gates open the crowd becomes more focussed towards the entry points. Finally after the gates open, but before the match begins, the crowd becomes highly directed in its dynamics. We can model different types of crowd behaviour in this way. The aim was not to reproduce an individual entity with complete certainty, but to produce graphical representations of the space required by the crowd and to assess the crowd safety issues. The Legion system developed during the research for this PhD models crowds, not individuals. The distinction between the individual and the crowd lies in the relationship of speed, density and the effect of entity interactions with each other and the local geometry. The speed, density and space utilisation maps allow us to qualitatively and quantitatively analyse the use of space over time. This in turn facilitates a greater understanding of the nature of the dynamics of the crowd to space requirement. The two dimensional maps, where differences between two maps and differences in the same map (at time t0 and at time t+n ) developed into a complex analysis tool. The author has applied this technique to reclaim underutilised space in high traffic areas with significant commercial success. The Legion crowd simulation highlights problems with the present legislation, examining specific cases where it demonstrates that a more appropriate methodology could be applied for safety analysis and risk assessment. Legion pedestrian simulation system was specifically developed as a testing tool for architectural designs. It is based on empirical observations made by ourselves, and compares favourably with previous and more recently published data [96, 97]. From new constructions: It is difficult to recommend precise dimensions in order to ensure the safe circulation of people, or to calculate appropriate holding capacities for concourses. Clearly, however, the width should take into account the entry, exit and emergency evacuation capacities required, as for any circulation route. The width should then be increased to take into account the additional anticipated usage of related facilities. Experience shows that this usage may be greater than is often expected. In addition, consideration should be given to the potential usage of concourses by spectators at events other than the sport for which the ground is primarily designed. This usage can be considerable if the event spans several hours, if inclement weather conditions prevail, and if large numbers are in attendance (as, for example, at a concert, for which the pitch or area of activity is used for viewing). The development of the simulation system extends beyond this thesis. The author lectures to building control officers, licensing authorities, stadium ground staff and the Police. Crowd dynamics workshops and training courses are planned at Easingwold (the Home Office Emergency Planning College). The models have been used around the world including the Sydney Olympic Games 2000. Notes from 2005: Since writing this thesis we have developed a wide range of software and simulation systems. We began chapter 5 with a list of criteria that a simulation had to manifest as an emergent behaviour rather than specific rules built into the system. We conclude with the same list, and discuss how the various observable crowd phenomena and criteria have been satisfied. Each entity is calculating its least effort at every step and will react in different ways depending on its local objective at its maximum motility bounded by the prevailing constraints. Each entity has the capacity to reacting differently according to its internal parameters and the changes in the environment as the simulation proceeds. The dynamics of the crowd emerge and are not implicit in the entities reactions to the changes in their environment. Press et. al. demonstrate that the principles of taking a step from x, y to x1, y1, by a random choice, is not efficient when a good local move exists. The process of an objective driven first choice route (focal route) is both analogous to the individual behaviour and to the crowds capacity for overcrowding (packing). The simulated annealing approach to the problem provides us with a technique for modelling a dynamical system that can be efficient in free space and endangering in confined spaces. In this way we model both the individual entity and the emergence of the crowd dynamic. Short cut exploitation is a function of the least effort algorithm and the assimilation algorithms demonstrate that this feature complies with human behaviour. 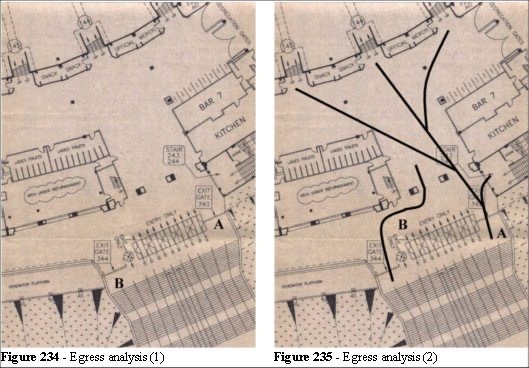 It is an important consideration when we are analysing different ingress and egress scenarios to model crowds behaving in a competitive manner in which every entity is trying to get in (or out) of its environment by the most efficient, least effort route. We need to find out, by applying the simulation, where such routes exist. A priori assumptions can be erroneous. Rules of a thumb are applied without due consideration and lives have been lost as a consequence. The simulation can be applied to search for these routes. Therefore replacing the present network analysis with a more appropriate focal route analysis will not only lead to a safer environment, but to a more efficient pedestrian planning and design criteria. Using the information space concept we can halt or slow entities accordingly, this allows us to assess realistic filling capacities. We have examined the differences between static and dynamic space, this would be a more appropriate methodology than the area divided by 0.5 recommended in the various building codes and guidelines. Static area calculations overestimate the crowd flow parameters and such calculations can be inappropriate, especially when the Fruin Level of Service is applied to larger, more dynamic areas of crowd flow. Consider the following example to illustrate this point. The total area in a circulation zone is calculated, for example 18,200 square metres. We want a Fruin Level of Service C, (some restrictions to speed: 2.32 to 1.39 metres per person) therefore the holding capacity for this area is 6,300 people. According to this calculation that area will facilitate 6,300 people. This was the calculation applied to a rotary system at the Sydney Olympics and is not only an oversimplification, but does not take the problems of dynamic circulation into consideration. We find in the analysis that there are bottlenecks and compression zones where crowds will accumulate to dangerous proportions. Crowds do not fill space evenly: they cluster, they exploit short cuts, they flock and they herd like sheep. Once committed to a route it takes more than passive signage to disturb them from their chosen course as was the case at Hillsborough. It is recommended that an overhaul of the safety guidelines, which includes some simulations or models, are used for safety analysis in existing and proposed designs. Clustering is a function of the speed distribution of the crowd. We could include a clustering function in the simulation; by programming groups that move together. But we find that such clusters occur naturally as a consequence of the speed distribution. In the edge effect model we saw that the geometry retards the entities and a cluster formed at a specific location. The Legion crowd simulation, and in particular the dynamic density maps, allows us to calculate the impact of local clusters on the overall crowd flows. This is an important factor in designing efficient and cost effective pedestrian areas where high density crowds are expected. In the simulation it is clear that we attribute no collective intelligence to the crowd. However, it is a feature of the algorithm that a complex problem can be solved without collective intelligence. This is a fascinating insight to the nature of intelligence and in particular colony intelligence. Furthermore there are no collective rules, the dynamics of crowds emerge from the interactions of the individuals in the crowd and not a group think, or crowd psychology. This may lead to a more sophisticated model of how the individual contributes to the overall behaviour of the crowd. We can now see the mechanisms that lie behind this statement. We briefly discussed the impact this fact has on network analysis (recommended by the Green Guide). We expanded on the problems of geometry and discussed Braess’s paradox which, during the design of egress routes, can lead to problems in calculating the effective egress routes. Focal routes were discussed and the following example will demonstrate the impact of these on egress analysis. Consider the Green Guide calculation for the following example from Wembley Stadium. There are two egress gates (A and B in Figure 234) each 3 metres in width. The total capacity for egress is therefore 3 x 2 x 109 = 654 people per minute. We have seen, from the examples in chapter 3.4, the imbalance of utilisation in an ingress. We have also seen, from the many examples of exploitation of short cuts that the shortest, straightest routes are the most exploited. One can now apply some simple geometric rules to assess the impact of the crowd during ingress or egress. Taking straight line routes, widening these line to the anticipated flows and trying to reduce the multiple path interference routes by design. We have seen from our example of gate 1 at the Hong Kong Jockey Club how difficult it is to direct people from those apparently optimal routes. A focal route analysis of the egress example (Figure 234) leads to the network (Figure 235). The application of a simple geometric rule would give some more realistic limits for egress calculation. The principals of focal route analysis should be part of our limits for egress calculations. If we add thickness to the line appropriate to the crowd flow then effectiveness of the egress routes can be more readily estimated. Adding noise to the direction of each entity after it has solved the least effort algorithm is the parameter named focus, this allows us to model the likely usage against the prescriptive people per metre per minute presently used in the guides. It is apparent that the emergent behaviour of the crowd is, to a degree, predictable. It is also apparent that the principles of focal route analysis should supersede the use of network analysis for ingress and egress analysis. From Figure 235 we can see that route B will begin to be used only when the route A has reached capacity. Route B is not in a line of sight (the pillars obscure the view). Our entities are designed to take these egress scenarios into account and behave in a more realistic, more human manner. The mechanisms of how this self organisation occurs are apparent from the model. The Legion entities neither communicate with each other nor are aware of the global nature of the crowd, they are selfish least effort exploiters. What emerges is the outer fringes of the crowd moves faster than the inner core. This produces different effects in different densities. The nature of self organisation at high density has implications for safety design and general circulation. There has been considerable commercial success with the model’s applications, and the company recently won a contract to model the Sydney Olympics against international competition. We have demonstrated two examples of its application, Balham and the Hong Kong Jockey Club. It is worth noting that the statistics gathered at the Hong Kong Jockey Club, in particular the ingress data, provides an important analysis in the future risk to crowds. The data relating to the entry numbers, turnstile distribution and geometry provide us with a profile of the arrival rates. This data, coupled with information from the train services represents a typical event ingress and the model can be scaled to accommodate larger numbers, capping the limits by the transportation modes. This is called the modal split where numbers arriving by car, train, bus or foot determine ingress flow rates. This data is essential to the analysis of crowd behaviour and dynamics so should be recorded, analysed and extrapolated to provide a more comprehensive risk analysis for future crowd arrival profiles. It is worth pointing out that Wembley did not gather that data, but did conform to the Green Guide, whereas the Hong Kong Jockey Club did gather the data and, in the concourse egress system, did not conform to the Green Guide. It is a recommendation of this research that the ingress data illustrated by the examples of the Hong Kong Jockey Club be universally accepted as good working practice. It is also the recommendation that, if in any doubt about the effectiveness of a safe and efficient event that a suitable simulation be tested against a suitable range of parameters. We have seen how the simulation can be applied to the modelling of safety criteria. We can also see that elements of design, routing, location of signage and the speed/density relationship effects both the comfort and safety of the patrons. We have also seen how the simulation can be applied as a what-if analysis tool for risk assessment. By monitoring the effects of density on the entities in the model we are effectively testing the effects that a dumb crowd may exhibit and experience.. The entities in the simulation do not have any form of artificial intelligence, they are following simple rules which allow them to endanger themselves. By this method we can assess the risk to the individuals and, through simulated experiments, using Legion, we can reduce these risks. It has been argued that people are "smarter" than the model and so it is not realistic. One need only look at the number of people who have lost their lives in crowd related disasters, such as Hillsborough, to realise that "smart" people have little choice in their actions. We conclude by restating that it is vital to the analysis of places of public assembly that something other than the prescriptive Guides are used. Simulation is a useful tool, as we have illustrated, for it provides insight and understanding to the users, owners and operators. For example, an exit is of little use in an emergency if it deviates from a focal route as Sime [43, 44, 45, 46, 47] demonstrates. We are not alone when we state that people will tend to use the route with which they are familiar, so basing evacuation plans on equal egress (especially where emergency exits are included) is erroneous. That sentiment has been stated many times, by many experts (Sime, Canter, Proulx et. al) yet this single factor has been the cause of many deaths in during emergency egress. In November 1998 400 people rushed a single exit at a discotheque in Gothenburg during a fire. Safety design methodology based on the present guidelines using unit widths of exit with no consideration to familiar routes, focal routes, psychological factors or crowd dynamics require reconsideration. One has to question the wisdom of these guidelines in the face of the physical evidence. Taken without the interpretation of a competent person, the relevance of exit widths meets the statutory requirements but, as we have demonstrated they may not meet the physical needs to safely and efficiently to evacuate the occupants in an emergency situation. It is only by the continual development of tools like Legion that we can make progress towards understanding the complexities of crowd dynamics, and thereby develop safer environments for large scale crowds. There is a continual development of these methods and algorithms, the end of this thesis does not mean the end of the author’s study of crowd safety. Perpetual development of more efficient algorithms, more user friendly interfaces and a more powerful analytical output will allow the dissection of the parameters of crowd dynamics relevant to crowd safety in even greater detail. The ultimate goal is to drive through the legislature that a simulation be a statutory requirement of a licence to operate a place of public assembly. We propose replacing the need for a competent person with the need for a competent simulation. It is hoped that Legion represents a new wave in the understanding of crowd safety through the study of crowd dynamics. 2013 update - At the start of this chapter I stated "There were three objectives to this research: Firstly, to understand the nature of crowd dynamics with respect to crowd safety. Secondly, to develop a more appropriate risk analysis methodology for the design and management of places where crowds may develop. Finally, to create a tool that allows others to understand the nature, problems and necessary components of crowds and crowd dynamics." Over the last decade, as the tools�were being used more and more towards "proving" safety I shifted my focus back to my original�research objectives.